The others who applied are former Board member Tyrone Langager of Minot; state Representative Richard Becker of Grand Forks; former state Senator Tom Seymour of West Fargo; Kristin Hedger of Dickinson; Dan Traynor of Devils Lake; Jill Louters of Sheyenne; La Lynda Nelson-Blotsky of Williston; Allan Skramstad of West Fargo; and Gregory Stites of Bismarck. A nominating committee will meet to select three candidates for each position. Those names will be submitted to Gov. Doug Burgum, who will make the appointment. The meeting date has not yet been set. The Governor’s Task Force on Higher Education Governance has begun its work. It held its first meeting at Bismarck State College Friday (1/12/18). In his opening comments, Gov. 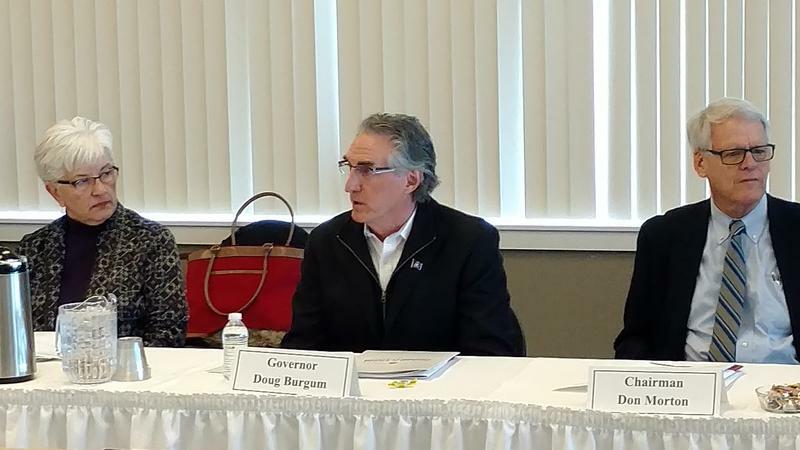 Doug Burgum said the mission is to look at the governance system – which dates back to the 1930s – and see if it can be tweaked or modified to meet the needs of 21st century students. Burgum also wanted to dispel some perceptions of what the task force will be doing.